Posted by Mollie Hamelund on February 1, 2019 in Basketball, Sports, Top Stories. Ferris women’s basketball improved their home record to 9-0 with a 16-point victory over Lake Superior State University Saturday, Jan. 26. The Bulldogs took the 62-46 victory easily, notching their third win in a row with the help of Ferris junior guard Riley Blair. Blair brought in 20 points total while also contributing on defense with six rebounds. “I’m really proud of this group and the growth over the last three weeks with key players in and out and others stepping up, mainly Riley Blair,” Ferris head coach Kendra Faustin said. Faustin said their undefeated home record is partially due to the players being comfortable and confident on the court they practice on every day. The Bulldogs have had their struggles this season with injuries to starting players, but the talent on the bench are always ready to jump in. 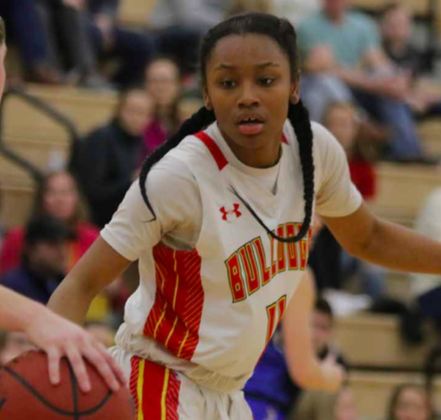 Ferris sophomore guard Adrienne Anderson went out recently due to a separated shoulder and junior forward Lilly George is out for the season with a torn ACL. Ferris senior guard Alexis Bush stepped up, getting 14 points while also assisting seven baskets and defending five rebounds. Other players have returned from injuries, such as Ferris junior guard Renee Sturm, who was recently out for a month and saw the court for the first time again last Saturday. “Shoot, I was nervous when I first came back after a month, but I’m thrilled to be playing again and I’m thrilled to come back to a home court where we feel comfortable playing,” Sturm said. Although home court advantage seems always a positive factor, Bush believes they try to not let it affect them too much and play just as hard everywhere they go. The Bulldogs will attempt to improve their away record 6 p.m. Thursday, Jan. 31, at Saginaw Valley State University in more conference play.